The ESRF had an extraordinary and ancient visitor this week: the most complete fossil skeleton ever found of the small plant-eating dinosaur, heterondontosaurus tucki, which roamed the earth 200 million years ago. This exceptional specimen was discovered in South Africa's Eastern Cape province and excavated by palaeontologist Billy de Klerk. Because the small skeleton is embedded in hard rock, attempts to extract the bones would cause irreparable damage. To study the dinosaur's anatomy, a team of scientists from the Evolutionary Studies Institute at the University of the Witwatersrand, South Africa, led by Professor Jonah Choiniere, has teamed up with palaeontologists at the ESRF to use the high-energy, high brilliance, wide X-rays produced to non-invasively reconstruct the skeleton in incredible detail. Over the last two decades, the ESRF has developed unique worldwide expertise in palaeontology. If fossil teeth, bones and skulls are examined on a daily basis by the ESRF's team of palaeontologists, the scanning of a complete skeleton remains exceptional. Heterodontosaurus was a small, plant eating animal with grinding teeth in the back of the jaw and big canines in the front. 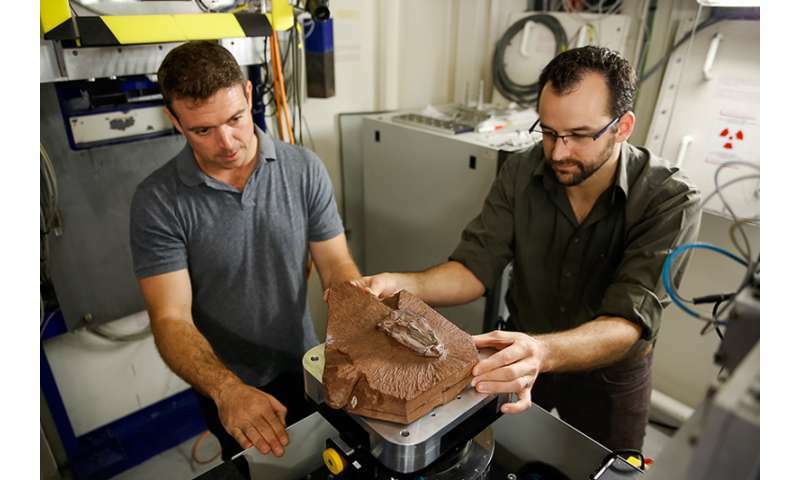 The scientists, led by Wits Professor Jonah Choiniere with ESRF's Dr Vincent Fernandez, scanned the specimen over five days using the extremely brilliant X-rays produced at the ESRF to help them understand how Heterodontosaurus ate, moved, and breathed. 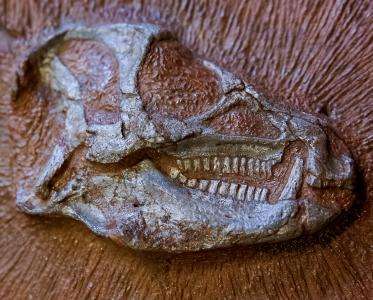 "There's still a lot we don't know about early plant-eating dinosaurs," said Choiniere, Professor at the Evolutionary Studies Institute, Wits University, "and we need new specimens like this one and new technology like the synchrotron to fill in those gaps". After five days of data taking, Jonah Choiniere and the team took a first look at the images. The reaction is unanimous, with a sonorous and collective "Amazing!". Choniere adds "Right away when we open these images we can tell quite a few things about the skull. One of the things is that it's likely a juvenile: the skull bones aren't strongly sutured together. We can also tell that we're really able to reconstruct the skull very, very well. On the first scans we can see the openings in the skull which are for the balance organs. We can digitally reconstruct the balance organs of the animal and tell how it held it's head and how it interacted with its environment. That's the sort of data you just can't get by looking at a skull in 2d. So it's very exciting." This work is part of a long standing collaboration between palaeoscientists based at the ESRF and in South Africa, an associate country of the ESRF. 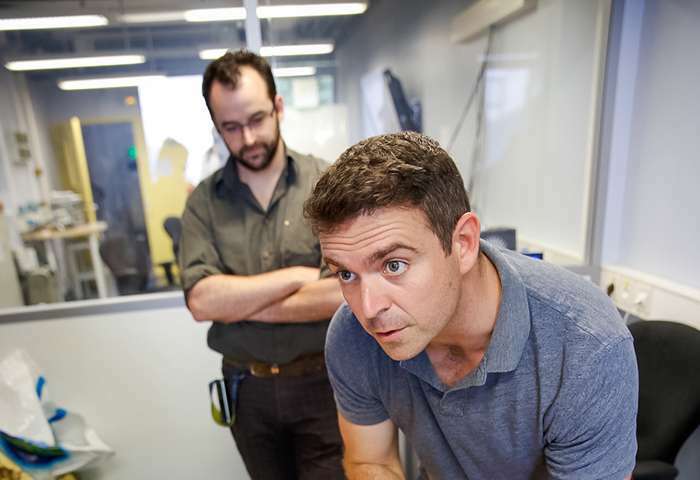 Just last year, the ESRF's Dr. Vincent Fernandez arranged for some of the world's oldest dinosaur embryos, originating from South Africa, to be scanned at the ESRF. 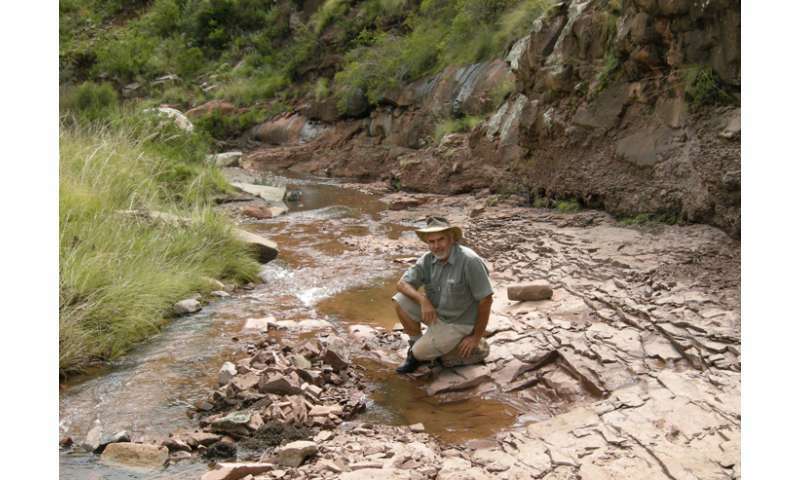 "The rocks of the Karoo from South Africa have yielded an extraordinary amount of amazing fossils" said Fernandez, "Since South Africa joined the ESRF as an associate country, we've been able to scan a lot of these fossils and work on projects that were not accessible before." Billy de Klerk found the dinosaur skeleton in a stream bed near a small town in the Eastern Cape province, on Hannie van Heerden's farm. 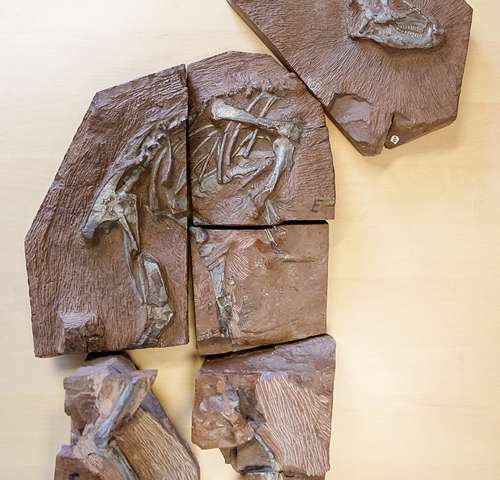 With the help of a crew from the Albany Museum in Grahamstown, de Klerk and John Hepple, a technician at Rhodes University Geology Department, excavated the fossil and painstakingly removed enough rock from the bones to identify the specimen. "A few more years on the streambed and the specimen might have been washed away," stated de Klerk, "we just happened to be at the right place at the right time." Further preparation work, however, was nearly impossible – the skeleton is too small and delicate, and the rocks around it too hard, to enable scientists to fully study the anatomy. That's where the synchrotron comes in: the high-energy X-rays generated by the ESRF facility will allow scientists to reconstruct the skeleton in incredible detail. Since 2000, the ESRF has developed unique worldwide expertise in palaeontology, designing non-invasive techniques specifically for palaeontological studies. 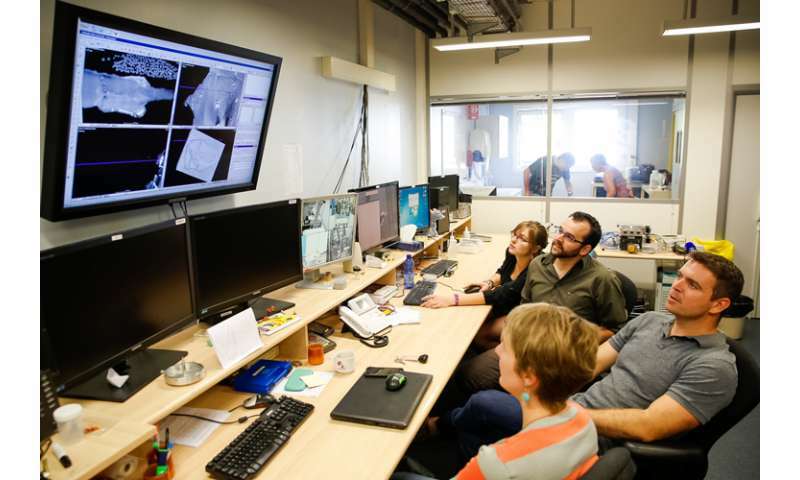 The ESRF also benefits from a team of experts in palaeontology and houses several beamlines dedicated to X-ray imaging. Together with local expertise on scanning fossils including some very famous pieces like Sediba or Toumaï, these ESRF beamlines offer the unique combination of high-energy, high brilliance and wide X-ray beams necessary to scan large fossils. The high coherence of the beam provides the key factor for this type of research: fossilised bones and the surrounding rock have very similar density and this feature enhances the contrast between the two in the resulting images, a critical advantage for virtually digging out the fossil. For this experiment, explains Vincent Fernandez, "the ESRF allows to do long distance propagation phase contrast micro-tomography on a large sample at high energy with a dedicated sample stage." Master's student and part of the scientific team, Kathleen Dollman, from Wits University, is hoping to apply this technique to the fossil crocodiles she is studying for her degree. "X-ray computed tomography (CT) methods have revolutionised palaeontology," stated Dollman, "and we can use these methods to understand so much about the biology of these extinct animals." The results of this research should provide valuable insight into the life-style of early plant-eating dinosaurs. But, as the popular saying goes, "patience reaps the greatest awards" and the processing of the data collected, an amazing 1TB (that's 60 piles of stacked paper as tall as the Eiffel tower), will take almost a year to complete. At the ESRF we have absolutely no doubts: the rewards will be great. Was kinda hoping for a view of the actual scanned skeleton somewhere in this article.